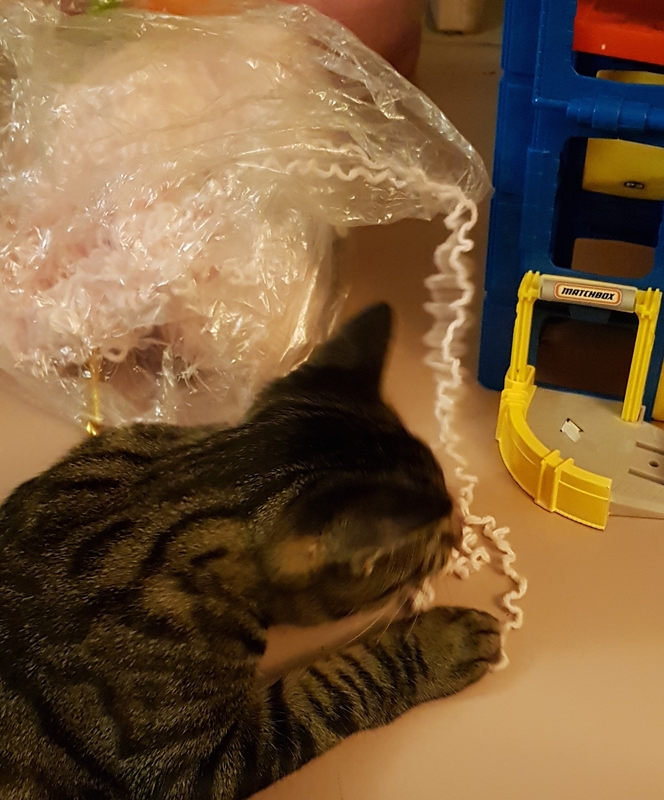 Cats and knitters* share a mystical superpower: they can suss out yarn anywhere, whether hidden behind walls of lead or at the bottom of a bargain basement sales bin. This attraction to long fibrous materials harks back to sunnier days when hanks of yarn grew on trees and children fell asleep when put to bed. Or maybe it’s a throwback to the days when we needed to hunt wool in the wild, tracking the crafty little fibers, and capturing them before they could get away and warn the others. 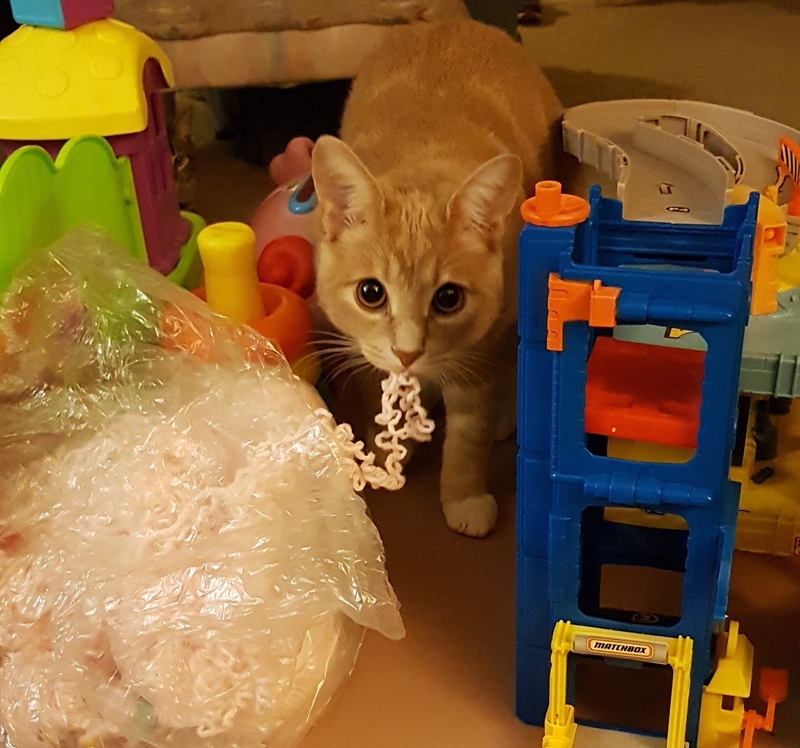 Cats think everything is a toy … or the enemy. They approach a ball of yarn with stealth worthy of a World War I infantry patrol. Their whiskers twitch and hindquarters shiver before pouncing on the unwary acrylic. Their victories depend upon how much yarn there is to unravel or chase around the room. Cats know when the babysitter’s bag contains mixed skeins or all the same yarn. Then they go for whatever is most convenient, closest to the mouth of the bag, not digging for the most rare or costliest fibers. The cat wages war on string from racial memory, an animalistic urge without sense or reason. Exploiting her superpower to the max, the knitter, however honed her yarn sense, will seek out the hand-dyed, single lot, rarest fibers. Her war is personal: acquire the most you can and die happy. Today, yak, alpaca, angora, merino, silk, and bamboo replace yesterday’s limited choices of Wintuk and Sayelle. The size of her stash trumpets victory. Prizes won at the Battle of Rhinebeck and war trophies from the Maryland Sheep & Wool Festival campaign embolden the warrior’s stashing efforts. She with the most yarn WINS! With different types of approaches, cats and knitters acquire their desires by stealth, persistence, and sheer dumb desire. Yarn. Ya gotta have it. * “Knitters” includes crocheters, too. Sometimes you just have to do it even if it isn’t perfect. I was itching to knit again in a big way. My last project was completed over a year ago! I’d been diddling around with swatches (test squares) using all sorts of yarn on all sorts of needles for several different patterns looking for the right combination that would propel me into the “zone.” I gazed at patterns on Ravelry.com until my eyes bugged out. I tried to match the types of yarn in my stash with patterns for which I had sufficient yardage. Yawn. Socks? No, that didn’t feel right. A sweater? Not enough yardage. I longed to knit but nothing spoke to me. Knitting has two basic stitches: knit and purl. Gauge and pattern determine if the project will succeed. Gauge relates the number of stitches across to the number of rows in a particular pattern using a particular size needle and yarn. Two knitters using the same equipment can get different gauges due to variations in how they knit! The typical “knit” pattern (called “stockinette”) requires you to knit across one row, turn the work around, and purl across the second row. There’s a flat side and a bumpy side. Then you count the number of stitches and the number of rows in 4″ x 4″ area and that’s your gauge. Easy peasy. Patterns are like recipes, written in abbreviations or charted, and keep you on track. If you consistently make your stitches with the same tension, it is likely the project will come to look like what it’s supposed to look like in the size it’s supposed to be. I can knit. I can purl. I can do stockinette squares. So I swatched. Ugh! So many times my gauges did not even approach the designer’s requirements! My stitch counts exceeded the recommended number for the patterns so I changed needles to adjust the stitches per inch—didn’t work. The lovely Rowan yarn seemed too dark; the fluffy Knit Picks yarn was too thin. I didn’t have enough of the tweedy yarn from England to do knee socks, and I’m not quite skilled enough yet to use the unspun Plötulopi from Iceland I’ve been saving. That’s when I put it down and waited. I even tried crocheting a yarmulke (kipa; skullcap) for my son. As I’d crocheted lace when I was younger, I was not afraid of this task. But yikes! I couldn’t see the stitches!! My 30-year old eyes were much sharper working with white cotton, and working with black crochet cotton and a teensy steel hook was madness!!! But I was itching to knit. The idea buzzed around in my mind like a mosquito seeking fresh skin. Knitters reading this are nodding. They know the feeling. I decided to just do it. Starting was hard. I swallowed, took a deep breath, and went to the yarn stash. It wasn’t going to be perfect. It wasn’t going to be the dream project I’d wanted to do with the lovely yarn in my stash. Oh no. With my fingertips I teased out the fugly yarn I’d inherited from my sister Michele. Acrylics. Oddball colors. Strange textures. Lumpy ends. 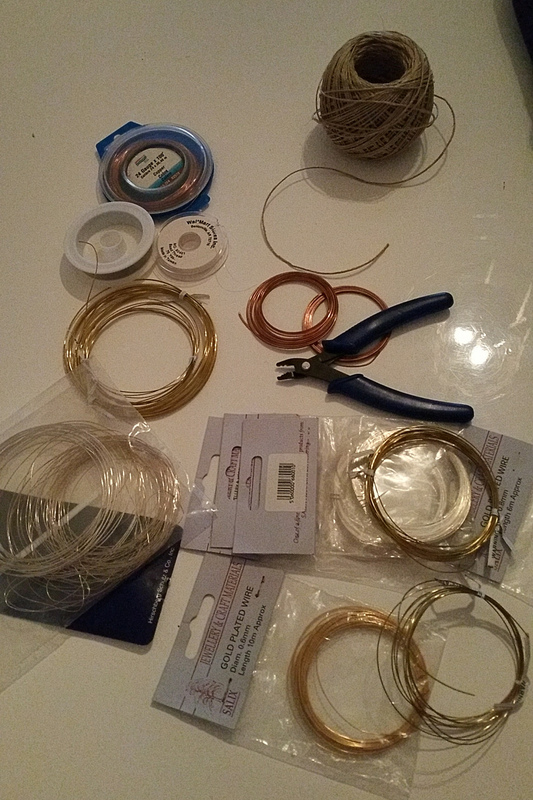 I decided to do what all knitters must do eventually; I started a stash busting project. 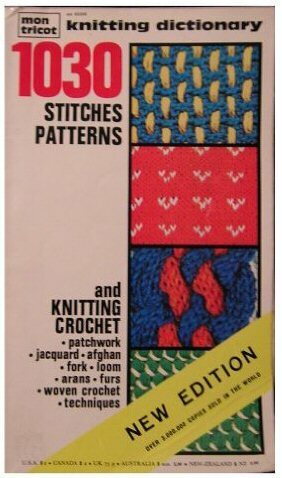 I picked up my 40-year old copy of Mon Tricot Knitting Dictionary that my sister loved to snitch from me and found a stitch pattern that required a multiple of 6 stitches plus 5. 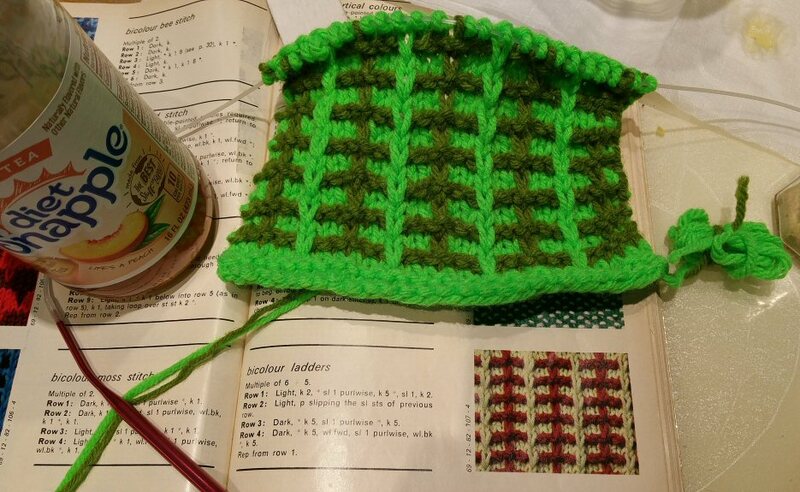 I cast on the unusual number of 29 Day Glo Green stitches while squinting. Then I proceeded to knit. Did you know that people advertise for volunteers on LinkedIn.com? I saw an ad for some organization requesting knitters to make scarves and hats for charity. A light bulb lit up in my mind. I could have my yarn and knit it, too. Although I was uncomfortable knitting this combination, I was more uncomfortable not knitting. To get in the zone, I had to get out of my comfort zone. I simply had to move where I saw no room to go forward. I needed to circumvent my usual route, the safe, comfortable path, and go outside the walls of perfection. Surely this scarf will win no prizes when it’s finished. My stitches are neat and regular but aside from that, the colors clash and the pattern is bumpy on the other side. Someone will wear it, though. It will be warm. It will be made with love. It will scratch my knitting itch. It’s an experiment, a new beginning. I will knit on the subway and get odd stares or elicit conversation. I will knit in the pizza shop after washing my hands to while away the time until my next appointment. I will traipse these sad skeins of yarn throughout New York City while I eyeball a good place to sit and knit. And knit I shall. These bicolour ladders will let me climb to a new, sublime place where I can be my imperfect self, working toward a higher goal, and getting some good knitting time while doing it. Plus, I’ll use up the ugly yarn and not have to look at it ever again!